As a wholesaler of contact lens, it’s important to be sure you have a wide variety of options for carrying cases. From safety to design, people will want contact lens cases for many reasons, and instead of buying them individually or specially made to order, it could save you a lot of time and money to buy them in bulk instead. In this article, you will read a few different reasons it is best to purchase from bulk contact lens case distributors instead of buying from a chain store. Buying from contact lens bulk distributors know the best ways for you to be able to save money. So when purchasing large orders, you’re likely to get a much better deal. Instead of spending the extra money on shipping and taxes each time you order a box of contact lens cases, order in bulk! You’ll save time and money and likely get a great deal! Not only that you will be able to order them in different styles for your different moods. When you are ordering individually or smaller orders, you are less likely to have the variety your clientele is searching for! If you are ordering contact lens cases in bulk, you have the option of choosing from an array of colors, designs, and even different styles! This will make ensure you that you will see more consumers coming into your business instead of ordering from a different store, one that doesn’t carry as any options. Not to mention making sure you hold different brands of cases, for the picky shopper who knows exactly what they want. When you do this, you open up your profit margin, because everyone needs something in every color, why not make it his or her contact lens case? The pro’s to carrying contact lens cases are simple; you will see hundreds of people in a day who wear contacts, which means you will see hundreds of people in a day who may need a new contact lens cases! After all every contact lens wearer needs something to keep them safe when they are not wearing them. You will want to carry a bunch of styles, colors, designs, and brands; while this may seem costly at first, it really opens you up for a greater profit margin. Just like glasses, people will be very specific with what they are carrying their eyewear in, even if it is just contact lens. So when you are considering buying bulk contact lens cases, consider it no longer! It is the best decision you could make. The cons? While it may be a little more costly up front to buy in bulk than you were initially planning, you can always check for great sales and deals, and always remember that by buying in bulk and stocking a large variety, you are opening up your margin for profit, so the initial blow to the pocket will be softened in the long run. There are almost no cons, whatsoever. Buying contact lens cases in bulk means having them when you really need them. If you sell contact lens, there is a chance you may give samples. After all, if you are giving someone a sample of contacts, you have to give them somewhere to store the contacts! Besides if you give them samples of the cases you carry, chances are they are going to want to purchase a case for their contacts that are more their style. Now in these scenarios, you naturally don’t want to give away your expensive cases, and if those are the only cases you have ordered and have on hand, then what? This is where ordering in bulk will really come in handy. If you have ordered come cheap contact lens cases in bulk, you will be able to give a sample case for your sample lens and not have to worry about taking a hit to the pocket when doing so. This also promotes good business practice and great business reviews. When people know that you have cared enough for them to give them something, they will more than likely continue to return to you for the rest of their products and purchases, again further opening your profit margin in the future. Whether it is today, yesterday or tomorrow, we could always use more money, so why lose the opportunity by not buying contact lens cases in bulk? When being fitted for lens, it is relatively normal that some customers may not know how to place a contact lens into their eye properly, which means it is going to take several attempts. In these trial and error processes, you want to ensure proper safety in transferring the lens. When you buy bulk contact lens cases, you are able to fill a case with contact solution and set it out for the customer to clean the lens with each failed attempt and try again, to ensure a clean contact lens with each go at trying to get the contacts into their eyes. This can be a trying process and we want to ensure there is no risk of infection or injury to them. Not only would that reflect poorly on your business, but also it would be a poor and painful experience for the customer, so not only are bulk contact lens cases saving you money and convenience, but also a business rating! No matter what the specific reason it is, it is great to try new things and purchase new things from new places. Without doing this, your business may become stuck in a rut and become dry and dull. 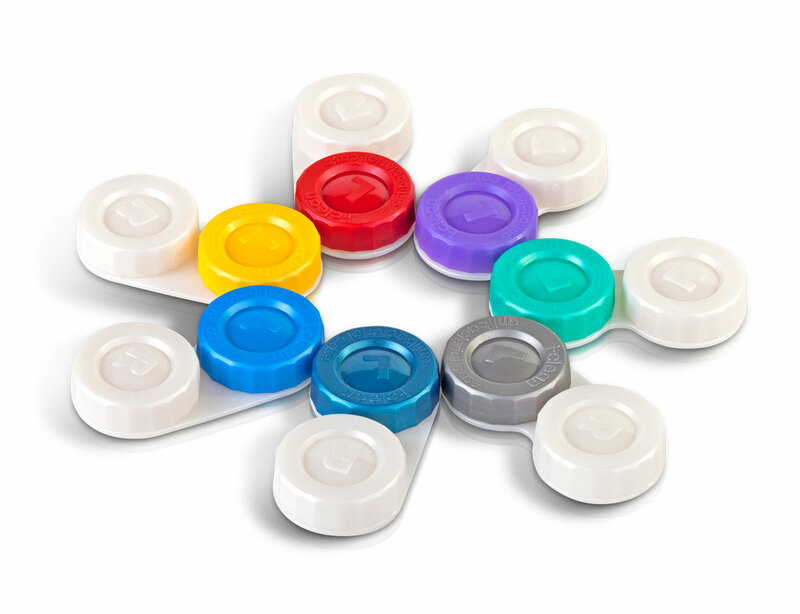 When you purchase bulk contact lens cases you open up the opportunity to try new colors, new designs, new brands, new options that were not previously introduced in your store; in turn attracting new customers, new crowds and more income. Allow yourself the freedom to try new things, you will find that it is purely beneficial to your business and your company.Contact lens accessories wholesale.